Most applications I write have some need for authentication and perhaps authorisation too. In fact, most apps most people write fall into that bracket. Here's the thing: Auth done well is a *big* chunk of work. And the minute you start thinking about that you almost invariably lose focus on the thing you actually want to build and ship. 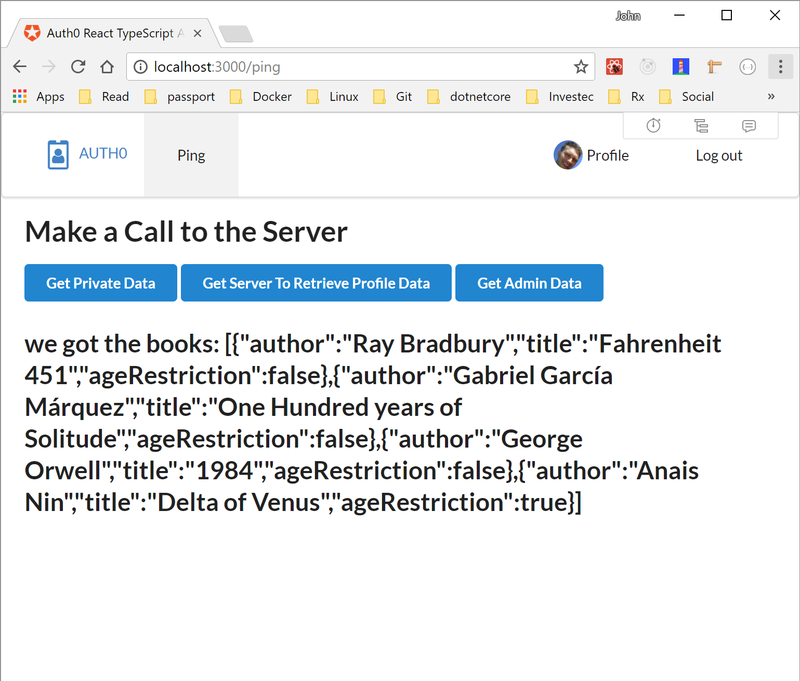 I want to use TypeScript on my client. I want that to be able to use the client side's Auth tokens to allow access to Auth routes on my server. Oh, and I want to use .NET Core 2 for my server. And in achieving all of the I want to add minimal code to my app. Not War and Peace. My code should remain focused on doing what it does. I ended up with unqualified ticks for all my criteria, but it took some work to find out. I will say that Auth0 do travel the extra mile in terms of getting you up and running. 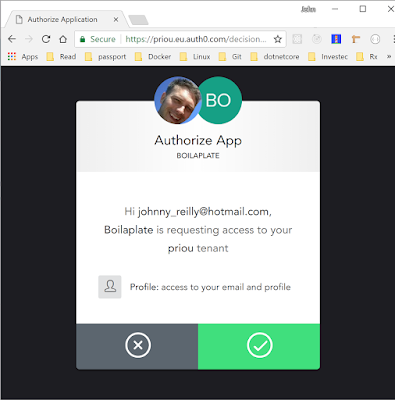 When you create a new Client in Auth0 you're given the option to download a quick start using the technology of your choice. Fork and clone the repo at this location: https://github.com/johnnyreilly/auth0-react-typescript-asp-net-core. What have we got? 2 folders, ClientApp contains the React app, Web contains the ASP.NET Core app. Now we need to get setup with Auth0 and customise our config. Here's how to get the app set up with Auth0; you're going to need to sign up for a (free) Auth0 account. Then login into Auth0 and go to the management portal. 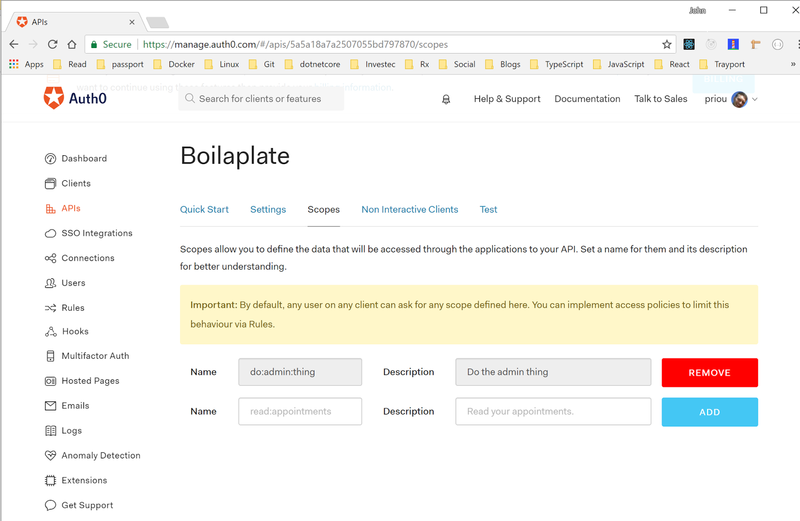 Create a Client with the name of your choice and use the Single Page Web Applications template. From the new Client Settings page take the Domain and Client ID and update the similarly named properties in the appsettings.Development.json and appsettings.Production.json files with these settings. 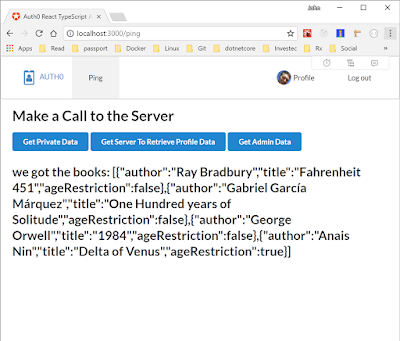 To the Allowed Callback URLs setting add the URLs: http://localhost:3000/callback,http://localhost:5000/callback - the first of these faciliates running in Debug mode, the second in Production mode. If you were to deploy this you'd need to add other callback URLs in here too. Create an API with the name of your choice (I recommend the same as the Client to avoid confusion), an identifier which can be anything you like; I like to use the URL of my app but it's your call. 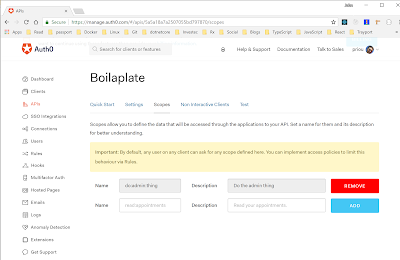 From the new API Settings page take the Identifier and update the Audience property in the appsettings.Development.json and appsettings.Production.json files with that value. Note that you can control how this scope is acquired using "Rules" in the Auth0 management portal. Which demonstrates that you're being granted an extra scope. With your new shiny access token you can now access the oh-so-secret Admin endpoint.